09.09.17 22:11;Account;Receive;Received Payment 9.5 USD from account U14279226 to account U1294000. Batch: 187743457. Memo: API Payment. Withdraw to all-hyips.info from BestTraders.Biz. 08.09.17 11:04;Account;Receive;Received Payment 1.00 USD from account U14279226 to account U1294000. Batch: 187604432. Memo: API Payment. Withdraw to all-hyips.info from BestTraders.Biz. 12.09.17 14:43;Account;Receive;Received Payment 6.00 USD from account U14279226 to account U1294000. Batch: 187991789. Memo: API Payment. Withdraw to all-hyips.info from BestTraders.Biz. 10.09.17 15:08;Account;Receive;Received Payment 6.00 USD from account U14279226 to account U1294000. Batch: 187793819. Memo: API Payment. Withdraw to all-hyips.info from BestTraders.Biz. 14.09.17 13:18;Account;Receive;Received Payment 7.25 USD from account U14279226 to account U1294000. Batch: 188184956. Memo: API Payment. Withdraw to all-hyips.info from BestTraders.Biz. 16.09.17 14:23;Account;Receive;Received Payment 5.00 USD from account U14279226 to account U1294000. Batch: 188383420. Memo: API Payment. Withdraw to all-hyips.info from BestTraders.Biz. 15.09.17 11:35;Account;Receive;Received Payment 5.00 USD from account U14279226 to account U1294000. Batch: 188277743. Memo: API Payment. Withdraw to all-hyips.info from BestTraders.Biz. 19.09.17 18:25;Account;Receive;Received Payment 2.5 USD from account U14279226 to account U1294000. Batch: 188673299. Memo: API Payment. Withdraw to all-hyips.info from BestTraders.Biz. 18.09.17 22:47;Account;Receive;Received Payment 6.5 USD from account U14279226 to account U1294000. Batch: 188591117. Memo: API Payment. Withdraw to all-hyips.info from BestTraders.Biz. 21.09.17 11:39;Account;Receive;Received Payment 6.00 USD from account U14279226 to account U1294000. Batch: 188838170. Memo: API Payment. Withdraw to all-hyips.info from BestTraders.Biz. 22.09.17 11:59;Account;Receive;Received Payment 6.25 USD from account U14279226 to account U1294000. Batch: 188939232. Memo: API Payment. 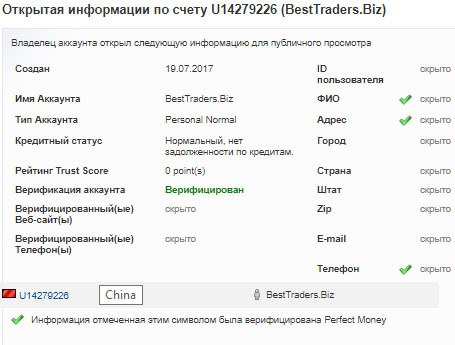 Withdraw to all-hyips.info from BestTraders.Biz.